Brief Description: Now is the time to find out how much you West Ham United fans really know, but be warned – your brains are sure to take a hammering as you struggle to answer the 1,000 challenging questions in this quiz book, covering every aspect of the team’s history, such as players, managers, opponents, scores, transfers, nationalities and every competition you can think of. You’ll be arguing with the referee and pleading for extra time as the questions spark recollections and ardent discussions of the legendary greats and nail-biting matches that have shaped the club over the years. With a fitting foreword by Hammers legend Julian Dicks, and bulging with important facts and figures, this book will entertain as well as educate, but be prepared for a few fouls and yellow cards along the way. 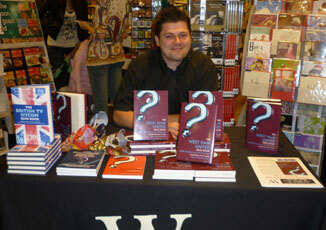 Special Note: £1 from every copy of the book sold will go to 'The Willow Foundation' Charity. This book is also available as an eBook. Old editions of this book carried the ISBN's: 1-904444-99-7, 978-1-904444-99-2 and 978-1-782818-53-3. About the Author: Chris Cowlin is an author, actor and entrepreneur. Born in London in 1980, Chris has achieved a great deal in a short space of time. With a background in printing and advertising, Chris owns a successful publishing company and is himself the author of 126 books. 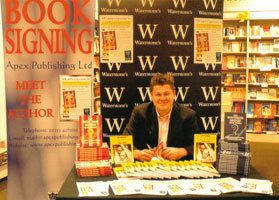 Chris has written on a range of subjects but specialises in football, sport, television and music. 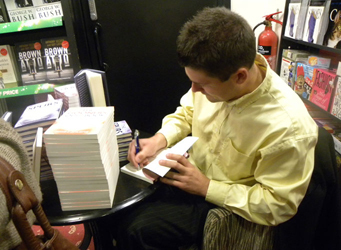 His books have been endorsed by many celebrities and sports personalities such as Jonathan Ross, Sir Alex Ferguson, Gary Mabbutt and Gary Lineker. His writing credits include a foreword for a book by notorious criminal, Charles Bronson, who Chris visited in prison on two occasions. He is also a regular contributor to The Sun, Daily Mirror and the letters page of local newspapers. A keen runner, Chris took part in the London marathon in 2012 and was shortlisted to carry the Olympic Flame in the same year. He regularly competes in running events across the UK and has raised over £35,000 for various charities. Chris also works as an actor, model and voice over artist. He has been involved in over 200 productions in the last two years including his personal highlight, appearing as an extra in the 2012 James Bond film, Skyfall. During his career, Chris has appeared in hundreds of newspaper and magazine articles and been interviewed on radio stations across the UK, promoting his books and charity work. He actively participates in social media and has over half a million followers on Twitter. Chris has been involved in many local community events in recent years; a former local councillor, elected in March 2012, having a majority of 798 votes, beating both the Conservative Party and the Labour Party. He was also a very active school governor between 2010 and 2012. Chris has two children, Harry and Aimee. A book that every Hammers fan will not be able to put down. I have watched West Ham for half a centery and the questions brought back amazing memories from John Lyall at left back onwards. Well done Chris. Great book for the ardent Hammers fan! We can relive all the highs! It was nice to see pictures of my old team mates. There were some questions I could not answer, although the ones I could brought back fond memories. 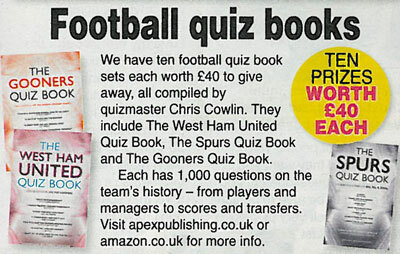 A great quiz book for all West Ham fans. A book packed with facts and figures on the Hammers, a must for all West Ham fans, it's great to see that a charity benefits with the sales of the book. Superbly researched and presented, a great treat for Hammers fans. Raises the bar in the 'quiz book' stakes. Well done Chris. Recommended. 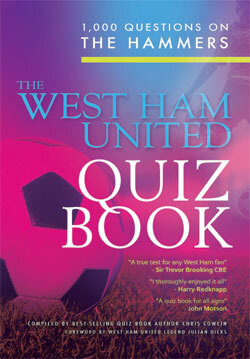 A very comprehensive quiz book that will be of great interest to all Hammers fans - and help to keep them entertained. I am not a great football fan myself but I grew up with a father and grandfather who were and as such this book bought back some great memories particularly when the questions related to the players of the seventies. I can see that this book must have taken a great deal of research and time to compile and Chris should be congratulated in putting it together so well. It is a must not only for Hammers fans but for all football enthusiasts as it is a great way of testing your football knowledge. Extremely acurate and covering many years of one of London's best known clubs over the years. I would highly recommend this book to any one young and old with an interest in West Ham United and indeed English football in general. A must for all Hammers fans, young and old, full of interesting facts and memories. I found the book very entertaining and a must for all West Ham supporters. I did answer some of the questions as I had the good fortune of referring at Upton Park. I am a Southampton fan but being a football fan as well allows me to appreciate the achievements of other clubs. That feeling of empathy, however, did not help me much while I sifted through the helpfully categorised queries, but I had a jolly good time doing it. West Ham United is a great club and the questions in this book do it good credit. I got 10 out of 10 on the Alan Curbishley subject and the other questions I really had to think about - a true test for any West Ham fan! A must for any serious Hammers fan. Hours of informative fun and "frustration!" Chris Cowlin deserves a lot of credit for the incredible amount of research he's done. A true test for any Hammers fan, fun and enjoyment for all the family. This book is brilliant! 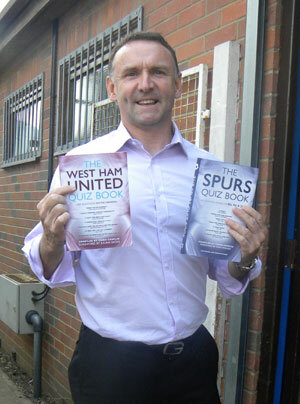 (Photo: Paul Allen with a copy of 'The Spurs Quiz Book' and 'The West Ham United Quiz Book'). Questions to test the memory banks of young and old supporters alike. 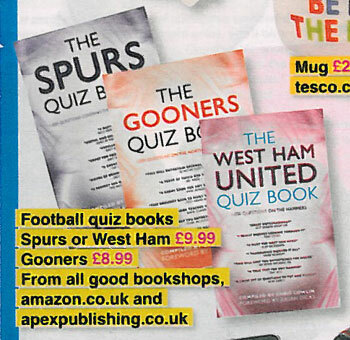 This quiz book is a must for all West Ham United fans. 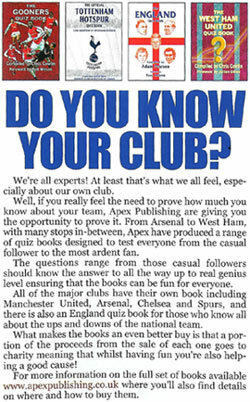 I've always enjoyed quizzes and this book is great for all Hammers fans to refer to and get enjoyment from. I really enjoyed looking through it. 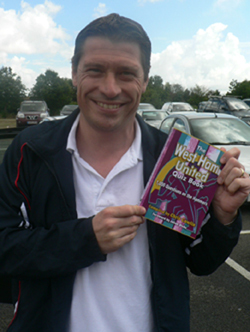 (Photo: Tony Cottee holding 'The West Ham United Quiz Book'). Thank you for sending me a copy of the quiz book, which I think is absolutely superb. The range of questions, spanning so many decades is interesting and at times extremely informative! An absolute must for all die hard Hammers, like myself. Perfect pre-match entertainment with a pint and a pie, also doubling up as a great source of reference on West Ham United. A lot of fun - a must for West Ham fans. Well done Chris. I really enjoyed the book, it brought back so many great memories, a must for all Hammers fans! On behalf of all the seriously ill young adults who will benefit from the donations of Chris Cowlin and Apex Publishing Ltd, thank you both very much for this act of kindness. 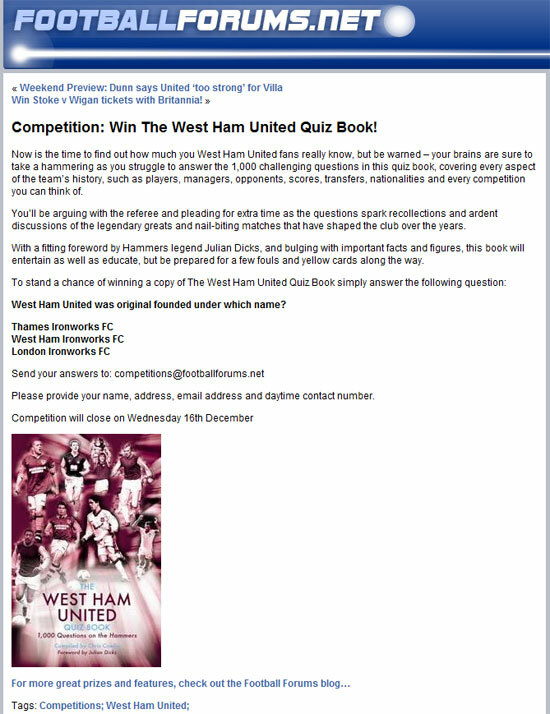 The Willow Foundation is extremely grateful for your generosity and wishes all the West Ham United fans who tackle this first-class quiz book - good luck with the questions! If, like me, you suffer from West Ham-itis, then this book is the perfect remedy. Pick up this book and relive those nostalgic moments of yesteryear, you won't regret it. A book packed with facts and figures on the Hammers, enough to test any West Ham fan. A must for all Irons fans! It looks a great read! 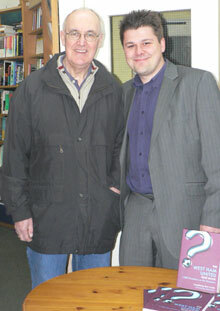 I am even trying it out on Sir Geoff Hurst! West Ham fans prepare to dig deep into 'Hammers' history. Very entertaining and extremely well written. This book is ideal for all footie fans - but, of course, particularly West Ham fans! To have a get-together - with a few jars - in the local, have a laugh and a joke and a go at a quiz about your favourite team, what could be better?! The compiler has excelled himself to come up with the range of questions - something for everyone to ponder over, and even the most diehard fan will surely learn something they didn't know about the Hammers! 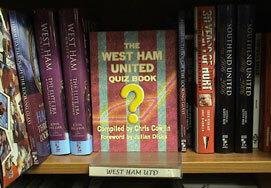 A quiz book for all ages, a must for any Hammers fan! A wonderful set of questions, perfect for any Hammers fan. Have as much fun with this book as I did with the Hammers! 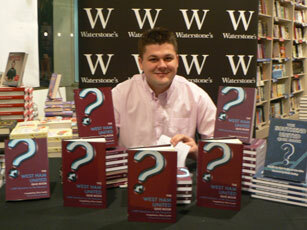 I will be using this book to help me compile quizzes at West Ham during corporate events. 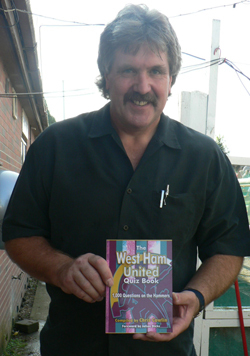 (Photo: Phil Parkes holding 'The West Ham United Quiz Book'). As a Hammers supporter for 49 years I can recommend this book as the interesting questions cover every aspect of the clubs history. (Picture: John Northcutt and Chris Cowlin). 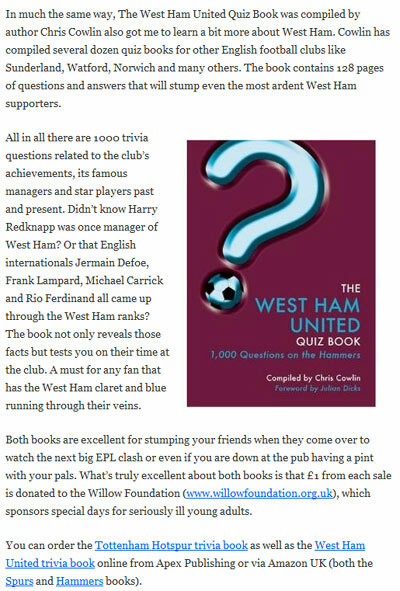 Why would you wanna support West Ham United is a quiz to many in itself, but we do and this book will test the most loyal of us. A must for West Ham fans! Very good! A must for West Ham fans! An excellent read that will test the most ardent of West Ham fans! Amaze your mates with your knowledge of West Ham Football Club! A must for all Hammers from all generations. 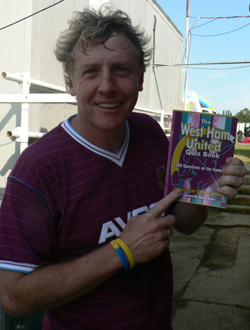 (Photo: Frank McAvennie holding 'The West Ham United Quiz Book'). A true test for all Hammers fans! 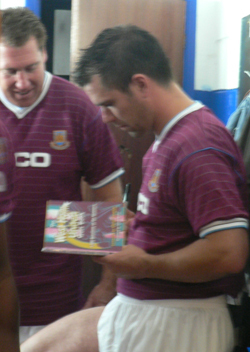 (Photo: Steve Potts and Greg Campbell reading 'The West Ham United Quiz Book'). A superb test of any Hammers fans knowledge. 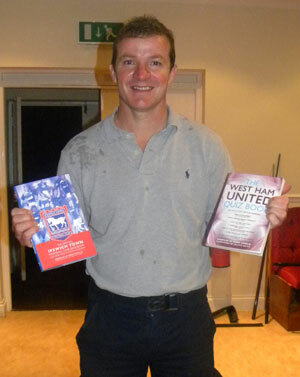 (Photo: Greg Campbell holding 'The West Ham United Quiz Book'). This book will keep Hammers fans entertained for hours! This quiz book has it all, facts, figures and information about West Ham, it's nice to see that a charity is benefiting as well. This book teaches you so much about the history and the players who have played for the club - fans would really enjoy this book. What a fantastic idea. This book is a must for all West Ham fans because it has it all: the history, past players, the Glory Years and so much more. I thoroughly enjoyed it all. I wish you every success with it. A great set of questions to try and tackle, have fun with these 1,000 questions. 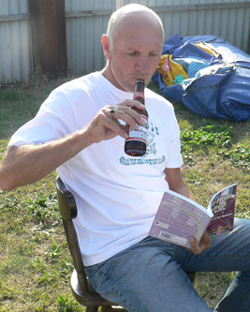 (Photo: Alvin Martin reading 'The West Ham United Quiz Book'). 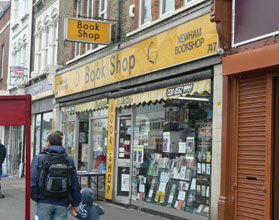 A book for anoraks, aficionados or serious students of West Hamology – you decide. Once you get started you are sure to get hooked. Enjoy! This book will test the biggest West Ham fans around! A true test for any Hammer, I certainly got caught out on a few but was pleased to get 10 out of 10 on the section about myself. 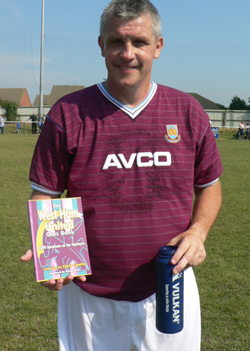 (Photo: Tony Gale holding 'The West Ham United Quiz Book'). A must for all West Ham fans, especially on those long away trips! Good variety, a few teasers and interesting too! Congratulations on a well presented quiz book. 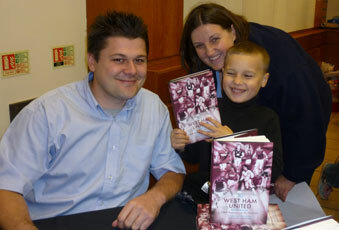 The variety of questions ensures that both young and old can enjoy the West Ham experience, past and present. 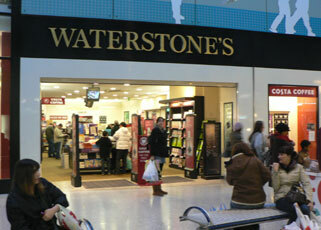 Well set out, not to hard which will give the younger fans a chance to enjoy the book as well as the older ones. Well done Chris. West Ham United has a great history and tradition. 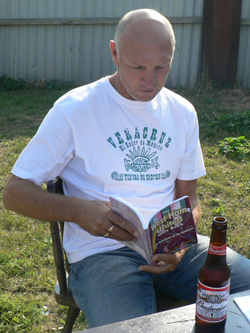 A quiz book that covers the whole spectrum of West Ham life - a fantastic read! 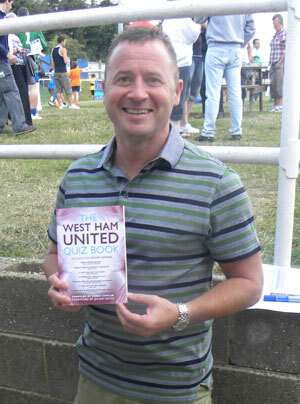 (Photo: Mark Ward with a copy of 'The West Ham United Quiz Book'). A true test for any West Ham fan, with 1,000 questions this is sure to keep you entertained for hours! When I joined West Ham United, I didn't know what to expect, John Lyall sold the club to me saying how great it was and how great the supporters are. I remember my first game against Everton and elbowing Trevor Steven, I didn't mean it (honest).I knew I would have a great reputation with the West Ham supporters. In my 11 years at West Ham I can honestly say I enjoyed all of them, but the one game that stands out is when we beat Cambridge at home on the final day winning 2-1, and I set up the winning goal for Clive Allen and getting promotion - that was a great day.West Ham has always had great players but the ones that stand out for me are Liam Brady, Billy Bonds, Alan Devonshire, Phil Parkes, Alvin Martin, Frank McAvennie and Tony Cottee, but if I had to choose one it would be Liam Brady, he was truly magnificent! I was also privileged to play with the younger generation which includes Rio Ferdinand, Joe Cole and Frank Lampard.This book is a must for all West Ham United supporters, it will test your knowledge of West Ham players, past and present and the history of this great club.I would like to thank everyone at West Ham, especially the supporters for my enjoyable 11 years, and I hope you have great fun with this book. All the supporters of the Greenwood and Lyall lounges would love this book! (Photo: Stuart Slater with a copy of 'The West Ham United Quiz Book' and 'The Official Ipswich Town Football Club Quiz Book'). 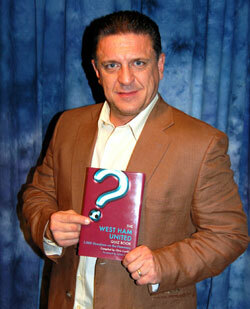 (Photo: Carlton Leach holding a copy of 'The West Ham United Quiz Book'). 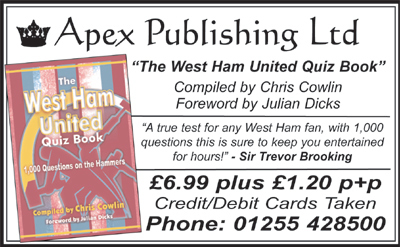 Chris has come up with a great quiz book here, a good mixture of easy, medium and hard questions to answer, even as a West Ham fan I have learnt a lot about the club by reading this book. An absolute must for any West Ham fan who enjoys testing their knowledge of the Hammers! This book is great when testing knowledge between friends when travelling to matches, this book passes the time when on a bus, train or in the car. book is a great read no matter how old you are. so get yourself down to your local bookstore and order a copy today. 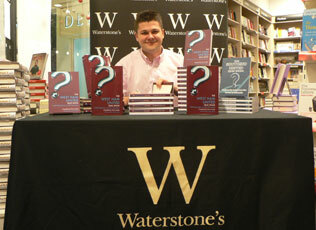 Alternatively you can enter our competition to win a copy of the book. another reason to go out and buy this book. No question about it, all Hammers fans should enjoy this! Sends you on a wonderful trip down memory lane! 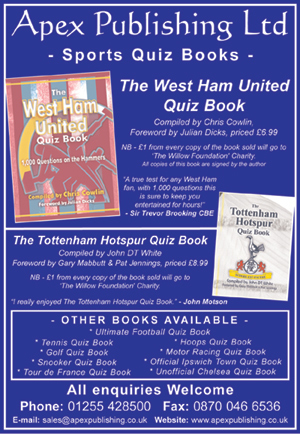 Ideal for the journey to the match, a get together in the pub, or even just to impress the family, the West Ham Quiz Book is a must for all Irons, everywhere. Enjoy! This is the sort of book I can give as a present to people. The questions are well thought out, Chris Cowlin must have done an awful lot of research. I'm very impressed! This is the sort of book that will settle a few arguments - and probably start a few more! An ideal present (stocking filler?) for the Statto Hammer! WHO WON THE CUP IN 1964? 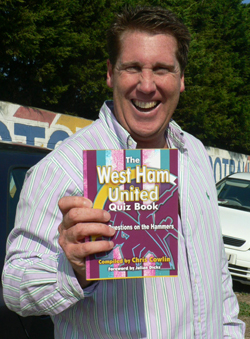 I've always enjoyed quizes and this book is great for all Hammers fans to refer to and get enjoyment from. I really enjoyed looking through it. Reckon you're a Hammers fan? Do you know your Brookings from your Devonshires? 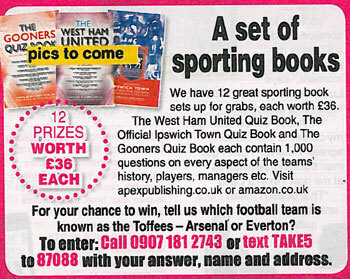 Prove you're not just blowing bubbles with 'The West Ham United Quiz Book'. More questions than you can shake a stick at! Not forever blowing bubbles, it's forever asking questions. Test your Hammer knowledge with this great quiz book. The whole history of the club, test each other on the terraces! There are 1,000 questions, compiled by Chris Cowlin, in THE WEST HAM UNITED QUIZ BOOK, including the following on players tranfers. Where did the following come from? Teddy Sheringham; Paulo Di Canio; Tim Breaker; Roy Carroll; Christian Dailly. 140 pages, £6.99, from Apex Publishing Ltd, ISBN 1-904444-99-7. Chris will donate £1 from each book sold to The Willow Foundation Charity, which is dedicated to improving the quality of life for seriously ill young adults throughout the UK. Seriously though, if you’re a football fan you’ll love this book. It’s packed full of stats and facts that any devotee of the Beautiful Game will find interesting – even Toon Army fans. Do you know who West Ham played in the 1980 FA Cup final? Of course you do. No? Well, read the book. Which manager signed Trevor Morley for the Hammers? Not sure? Well, read the book. 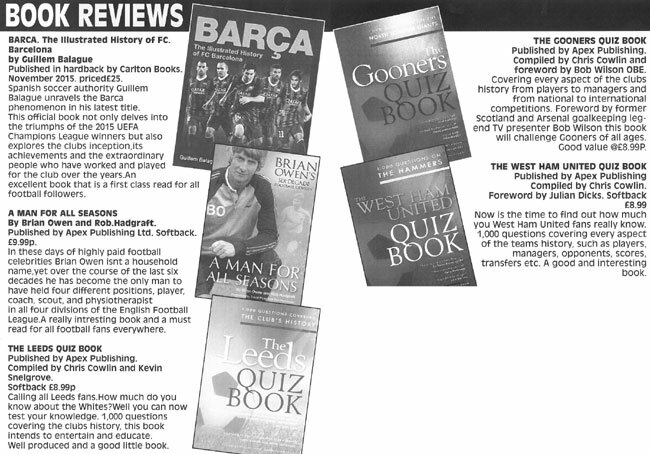 Hundreds of West Ham-related questions pepper the pages, alongside nostalgic pics of Hammers stars ancient and modern. This is a brilliant quiz book, and if you don’t believe me read the reviews of Sir Trevor Booking’ Jimmy Greaves and other stars on the back cover. 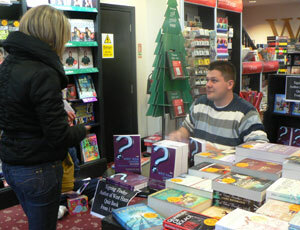 Best of all, a donation from every copy sold goes to the Willow Foundation which looks after seriously-ill young adults. If you're born to be Claret and Blue, this is the Christmas stocking filler for you! If you, like me, love to test your knowledge in a good football quiz, then this book is must. Great questions about our beloved Hammers. The book is a must for all West Ham fans with questions ranging from who was the club's player of the year in the 1985-86 season to the career of our very own Liam Brady at Upton Park. A fabulous production, compiled by Chris Cowlin. 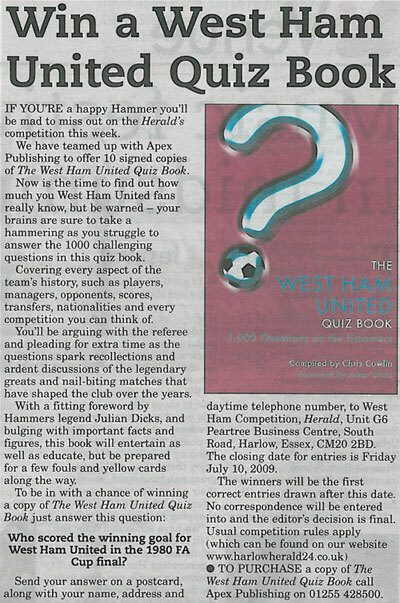 "The West Ham United Quiz Book"
Everyone who knows me, particularly in the West Midlands, knows that I am a most hardened Wolverhampton Wanderers football fan, that I bleed black and gold blood, and constantly impress on others the sleeping giant is about to awaken and take the premiership by storm. But being serious, any football fan, particularly those from the East End who love West Ham must get this book. Page after page of fascinating questions about the Hammers, West Ham's history, their achievements, failures, and quirky things that bring a smile to any reader. What is really nice about this book is that it also helps with a most honourable charity, The Willow Foundation. If you love West Ham, this book has to go on your bookshelf, but it won't stay there long I can promise you. Around 1,000 questions on The Hammers covering every aspect of the team's history, such as players, managers, opponents, transfers, nationalities and every competition. 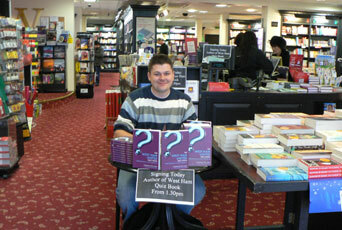 With a foreword by Julian Dicks, £1 from every copy of the book sold will go to The Willow Foundation charity. A book that will entertain any West Ham United fan, it certainly entertained the Boys of 86 squad! 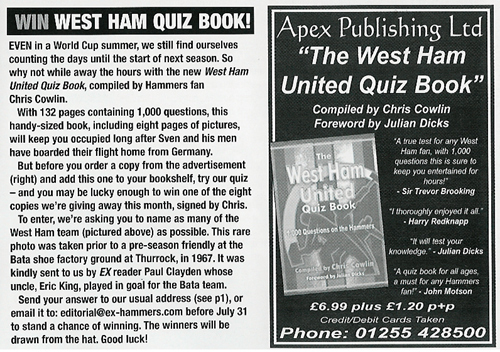 Like the Hammers themselves, the West Ham United Quiz Book provides great entertainment. It will have fans thinking long and hard about the marvellous players that have been with the club. An ideal stocking-filler for Hammers fans! A great idea! A must for all West Ham fans of all ages and the perfect Christmas stocking filler for any Hammers fan! 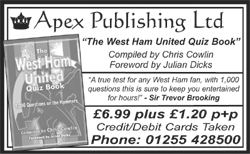 A new quiz book: The West Ham United Quiz Book - 1,000 Questions on the Hammers (compiled by Chris Cowlin) includes a foreword by Grays Athletic boss Julian Dicks. Chris Cowlin has compiled the tome which is due for release on 4 December 2009. Hammers fans will be able to find out how much they really know about the famous East London club. The book covers every aspect of the team’s history, such as players, managers, opponents, scores, transfers, nationalities and every competition you can think of. And the publisher sways that those who buy the book will be arguing with the referee and pleading for extra time as the questions spark recollections and ardent discussions of the legendary greats and nail-biting matches that have shaped the club over the decades. 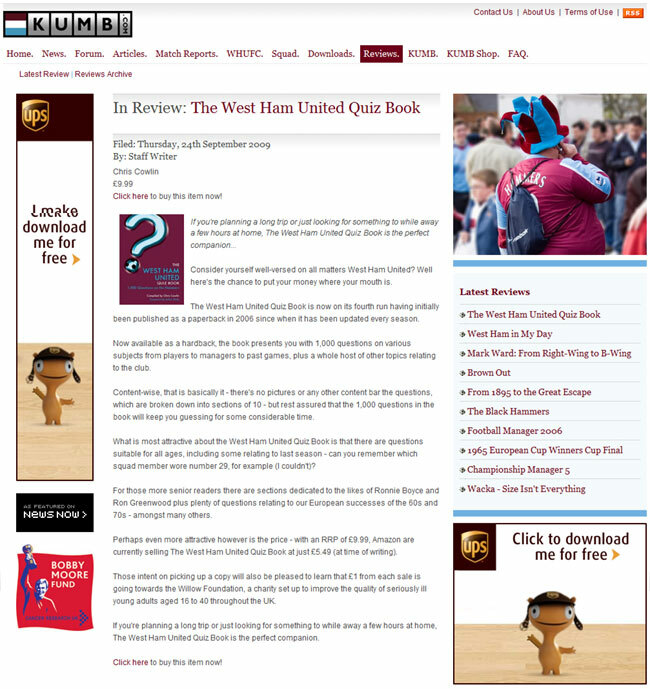 IF YOU ARE struggling to find a little present for your West Ham mad relative, then look no further than the West Ham United Quiz Book, which has just been updated and released as a paperback. There are a host of endorsements at the back of the tome, including contributions from the likes of John Motson, defunct fanzine Ironworks Gazette and former West Ham chief executive Scott Duxbury, but don’t be too put off by that. This is not a book compiled by a Hammers nutter. 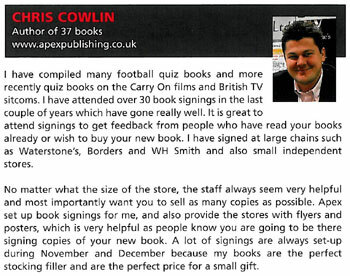 Chris Cowlin is more of a quiz book aficionado and has written other books on cricket, Carry On films and even Colchester United. Some of the categories and questions will infuriate, others will delight, while trying to find the appropriate answers in the back to go with the questions, can be a little test in itself. On the plus side, £1 from every sale will go to the Willow Foundation, a charity that raises money for ‘special days’ for young adults with life-threatening diseases. If you ever wanted to know Scott Parker’s middle name; what year Joe Kirkup was born and how many under-21 caps Christian Dailly won, then this book is for you. If you don’t, then maybe steer clear. 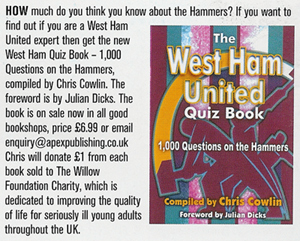 A FUNDRAISING quiz book described as a must for all Hammers has been released. 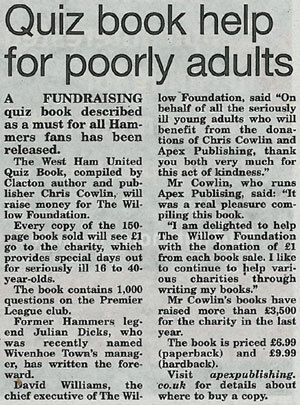 The West Ham United Quiz Book, compiled by Clacton author and publisher Chris Cowlin, will raise money for The Willow Foundation. Every copy of the 150-page book sold will see £1 go to the charity, which provides special days improves for seriously ill 16 to 40-year-olds. 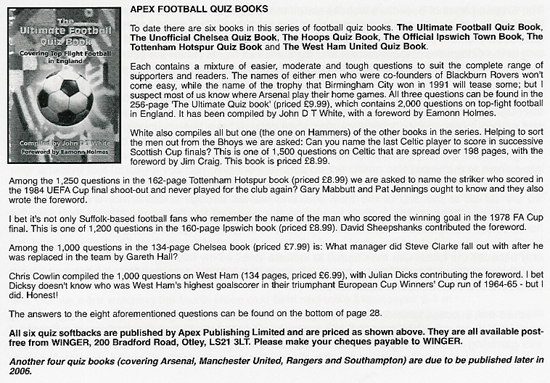 The book contains 1,000 questions on the Premier League club. Former Hammers legend Julian Dicks, who was recently named Wivenhoe Town’s manager, has written the foreward. 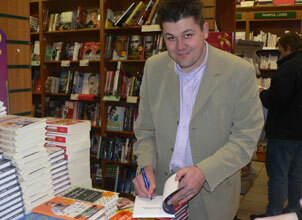 Mr Cowlin, who runs Apex Publising, said: “It was a real pleasure compiling this book. 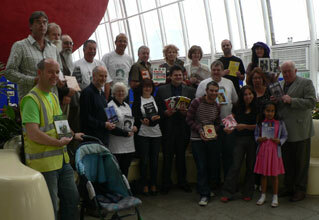 Mr Cowlin’s books have raised more than £3,500 to the charity in in the last year. 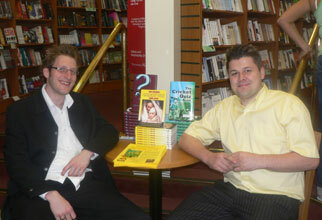 The book is priced £6.99 (paperback) and £9.99 (hardback). Visit apexpublishing.co.uk for details about where to buy a copy. 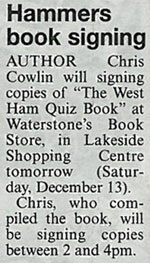 AUTHOR Chris Cowlin will signing copies of “The West Ham Quiz Book” at Waterstone’s Book Store, Lakeside Shopping Centre. 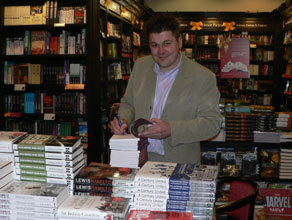 Chris, who compiled the book, will be signing copies between 2 and 4pm on Saturday December 13. 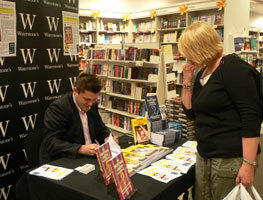 11 December 2010 - Chris Cowlin was interviewed on Your Thurrock. 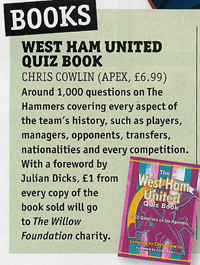 Chris answered questions about his book 'The West Ham United Quiz Book'. 10 December 2009 - Chris Cowlin was interviewed on Gateway 87.7 FM. 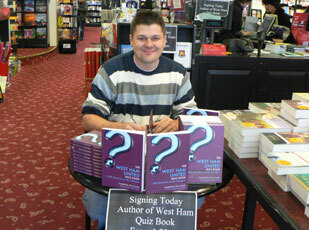 Chris answered questions about his book 'The West Ham United Quiz Book'. 17 December 2009 - Chris Cowlin was interviewed on Link 92.2 FM. 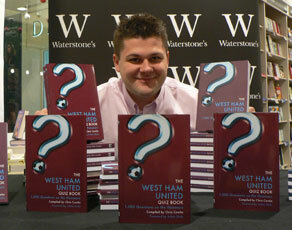 Chris answered questions about his book 'The West Ham United Quiz Book'. Chris was interviewed on 'The Roni O'Brien Show'. 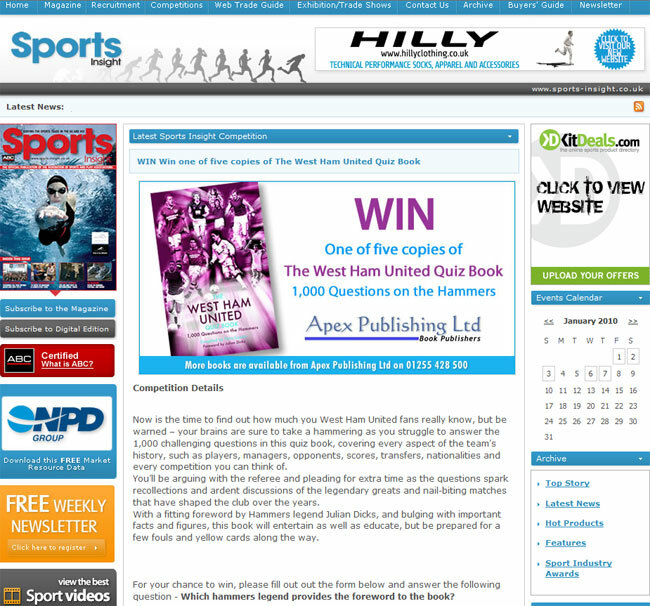 Afan 107.9 FM featured and run a competition on 'The West Ham United Quiz Book'. A terrific test of all things Hammers related... A must have for every West Ham fan! What a pleasure it was reading this book and I was surprised on how much I learnt. The book weren’t just entertaining but educational and I think that this is unique. 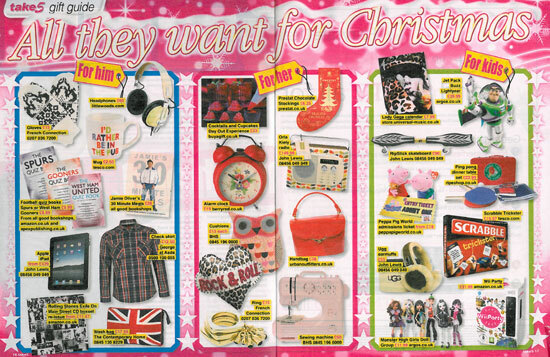 It is also a great stocking filler. After reading some of the questions in the this book, I even quoted some facts I learnt. A well balanced mixture of fun and formidable questions that will put even the most ardent Hammers fan to the test! A great book to have on your shelf pre or post match! 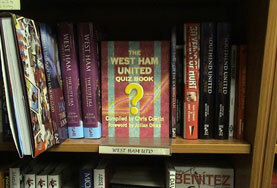 The West Ham United Quiz Book was featured (and a competition run) on Swansea Bay Radio 102.1 FM, on 'The Jay Curtis Show'. 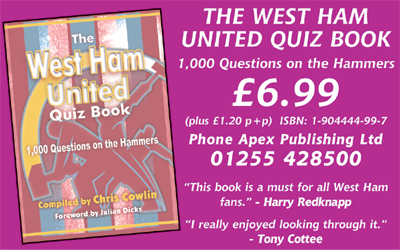 Colchester Garrison 107 FM featured 'The West Ham United Quiz Book' compiled by Chris Cowlin on 'The Liz Mullen Show', they also gave a copy away in a radio competition. 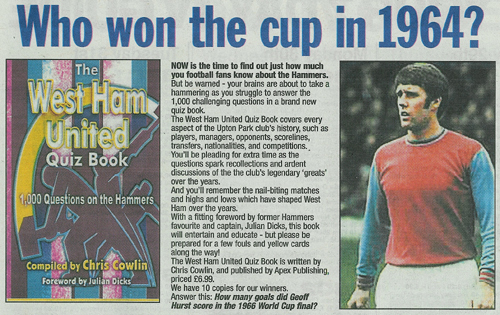 27 December 2010 - BBC Radio Essex 103.5 & 95.3 FM feature 'The West Ham United Quiz Book' compiled by Chris Cowlin. 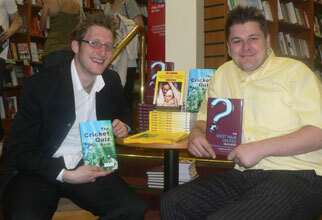 The book was featured on 'The Mark Punter Show', where Mark tested listeners about their knowledge on the club. 28 November 2012 - Chris Cowlin was interviewed on 'Betar Bangla 1503 AM'. 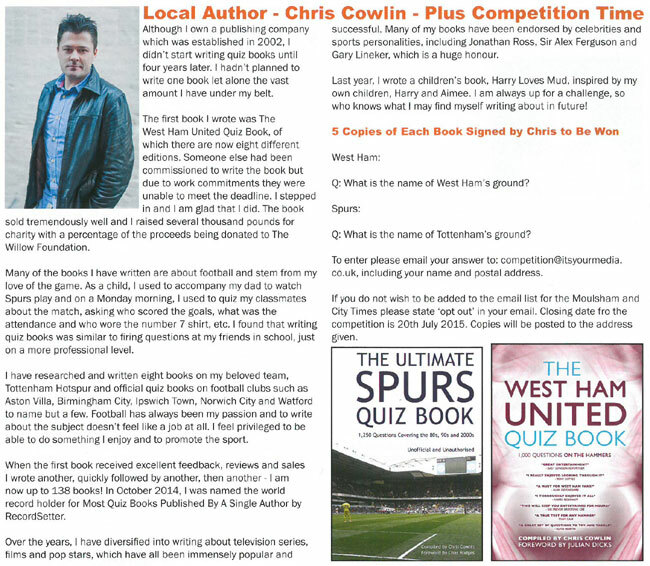 Chris was interviewed about his book 'The West Ham United Quiz Book'. 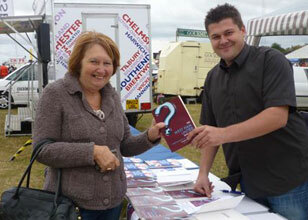 23 December 2013 - Chris Cowlin was interviewed by BBC Radio Essex 103.5 & 95.3 FM on 'The Mark Punter Show'. 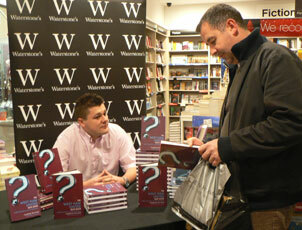 Chris answered questions about his book 'The West Ham United Quiz Book'. Chris also set a quiz (10 questions) for Charlotte Jaconelli ('Britain's Got Talent's' 2012 contestant and runner-up and one half of 'Jonathan and Charlotte'). A book with facts and figures about the famous club 'West Ham United', this book taught me so much I didn't know! I really enjoyed testing myself on West Ham United, I thought I knew a lot about my beloved team until I read this book! This book is a true test! What a great book, a perfect gift for any West Ham United fan! 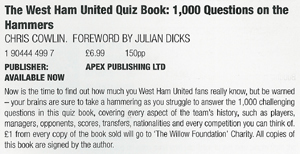 A super set set of questions for West Ham United fans to try and tackle, nice to see that legend Julian Dicks has written the foreword. A superb set of questions to test the knowledge of all hammers fans, young and old. What a fantastic test of knowledge of the Hammers. I really tested myself on West Ham. 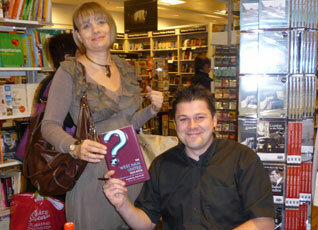 A gread book to have down the pub with your mates and test them - see how much they really know! 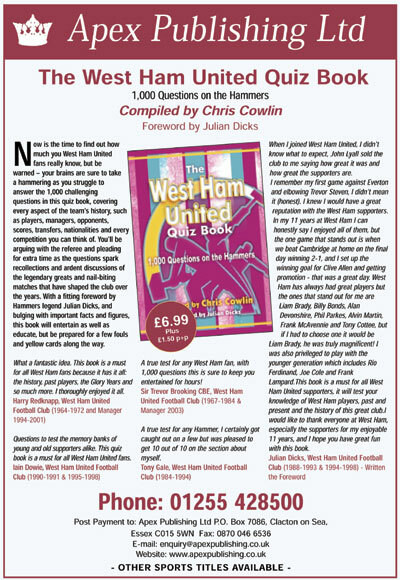 1,000 questions on the hammers - what a test for even those people who think they know it all... A fantastic amount of research has gone into this, well done Chris Cowlin. A great amount of research in one book - this book is a must for any Hammers fan! A great read and lots of fun! Congratulations on the production of an excellent quiz book. It is the best book I have seen to date. The book is top quality, outstanding and top value, worth reading time and time again. 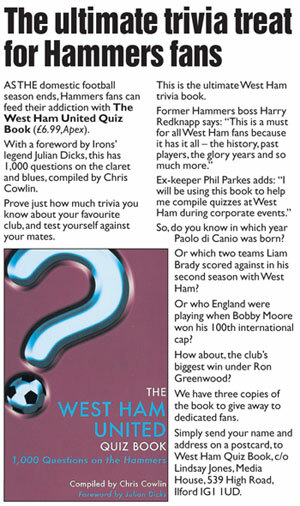 A great set of questions for any Hammers fan to try and answer - I am sure anyone will get caught out on a few! A true test for any West Ham United fan. This is an excellent well balanced publication. It could be used for reference purposes. The questions are comprehensive and well thought out and would interest all Hammers fans of any age group. I found this book helpful and useful – finding out things I never knew. It is nice to know that Julian Dicks it still about and thought of as he is a West Ham favourite among life long fans. A brilliant book, fun for parties and very interesting. This filled up quite a few hours, very interesting; being an old West Ham girl of 77 years of age I loved it to bits. I am sending it on to my son in Thailand, he has been a West Ham fan since he was born, now 49 years. I know he will love it too. I couldn’t put it down as it was so interesting. 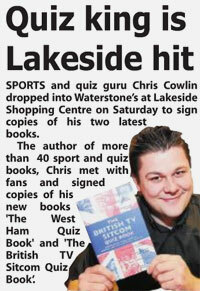 Chris Cowlin signed copies of his books 'The West Ham United Quiz Book' and 'The British TV Sitcom Quiz Book' at Waterstone’s, Lakeside Shopping Centre, Thurrock. 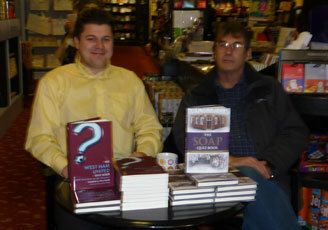 Chris Cowlin (with Mark Bennison, right, compiler of 'The Soap Quiz Book) signed copies of his book 'The West Ham United Quiz Book' at Waterstone’s, Ilford. 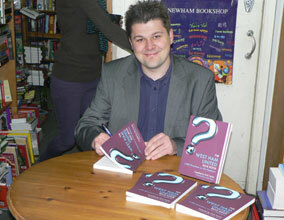 19 April 2008 - Chris Cowlin signed copies of his book 'The West Ham United Quiz Book' at Newham Bookshop, London. 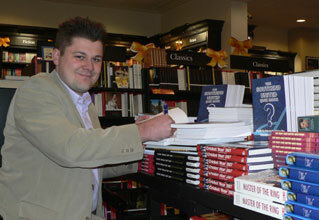 Chris Cowlin signed copies of 'The West Ham United Quiz Book' at Waterstone's, High Street, Southend. 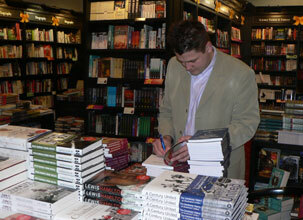 Chris Cowlin signed copies of 'The West Ham United Quiz Book' at Waterstone's, Lakeside. 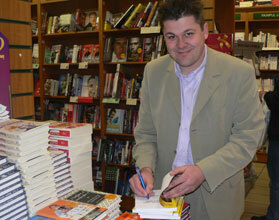 Chris Cowlin (right) signed copies of 'The West Ham United Quiz Book' at Waterstone's, High Street, Chelmsford. 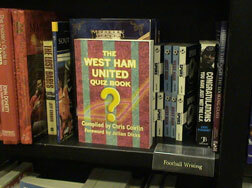 'The West Ham United Quiz Book' on sale at Waterstone's, Chelmsford (The Meadows). 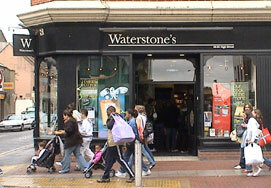 'The West Ham United Quiz Book' on sale at Waterstone's, Southend on Sea (High Street). 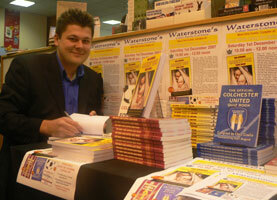 Chris Cowlin signed copies of 'The West Ham United Quiz Book' at Waterstone's, Culver Square, Colchester. 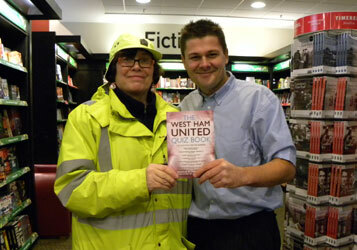 Chris Cowlin signed copies of 'The West Ham United Quiz Book' at Waterstone's, Basildon. 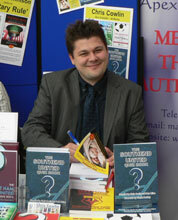 28 May 2009 - Chris Cowlin signed copies of his books 'The British TV Sitcom Quiz Book', 'The Official Colchester United Quiz Book', 'The West Ham United Quiz Book' and 'The Gooners Quiz Book' at The Suffolk Show 2009. 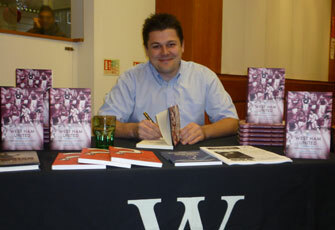 Chris Cowlin signed copies of his book 'The West Ham United Quiz Book' at Waterstone’s, Ilford. 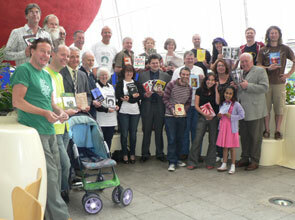 7 June 2008 - Chris Cowlin with all of the authors that attended The Southend Book Fair (Southend Festival). 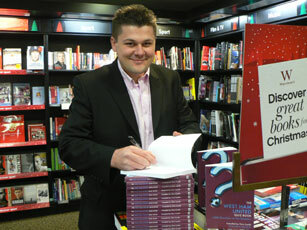 Chris Cowlin signed copies of his book 'The West Ham United Quiz Book' at Waterstone's, Romford. 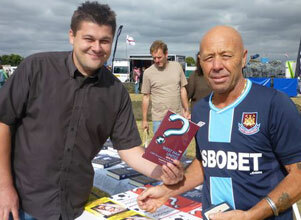 12 September 2009 - Chris Cowlin signed copies of his books 'The British TV Sitcom Quiz Book', 'The West Ham United Quiz Book', 'The Official Carry On Quiz Book', 'The Official Colchester United Quiz Book', 'The Southend United Quiz Book' and 'The Gooners Quiz Book' at Essex Country Show 2009. 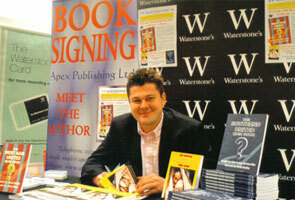 7 June 2008 - Picture Left: Chris Cowlin signed copies of his books at The Southend Book Fair (Southend Festival). 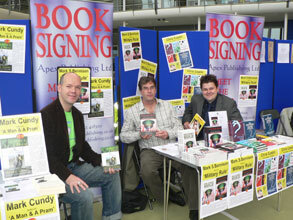 Picture Right: Chris Cowlin (right) with Apex Publishing Ltd authors Mark Cundy (left) and Mark S. Bennison (middle). 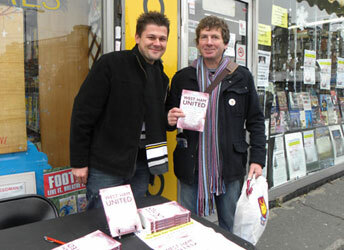 27 November 2010 - Chris Cowlin signed copies of his book 'The West Ham United Quiz Book' at Newham Bookshop, London. 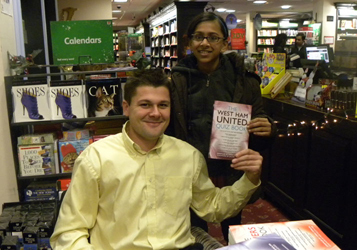 17 December 2010 - Chris Cowlin signed copies of his books 'The West Ham United Quiz Book' and 'The Spurs Quiz Book' at Waterstone's, Romford. 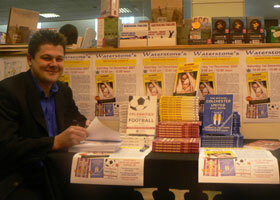 18 December 2010 - Chris Cowlin signed copies of his books 'The West Ham United Quiz Book' and 'The Spurs Quiz Book' at Waterstone’s, Basildon. 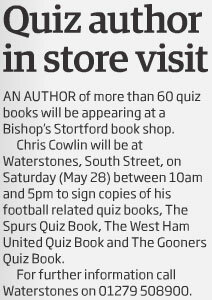 17 June 2011 - Chris Cowlin signed copies of his book 'The West Ham United Quiz Book' and 'The Spurs Quiz Book' at Waterstone's, Lakeside Shopping Centre, Thurrock. 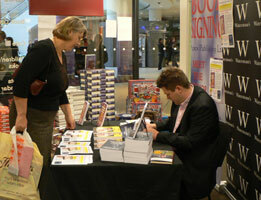 Waterstone's events manager Mark said: "Another great signing, it is always a pleasure to have Chris in our store." 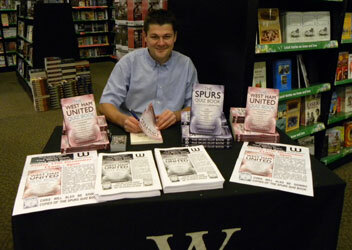 22 December 2011 - Chris Cowlin signed copies of his books 'The West Ham United Quiz Book' and 'The Spurs Quiz Book' at Waterstone's, Lakeside Shopping Centre, Thurrock.